T7 DNA Ligase is an ATP-dependent dsDNA ligase from bacteriophage T7. Not sure which ligase to choose? Refer to our DNA and RNA Ligase Properties Chart. T7 DNA Ligase is an ATP-dependent ds DNA ligase from bacteriophage T7. It will catalyze the formation of a phosphodiester bond between adjacent 5´ phosphate and 3´ hydroxyl groups of duplex DNA. Cohesive end ligation and nick sealing can be efficiently catalyzed by T7 DNA Ligase (1,2). However, unlike T4 and T3 DNA Ligases, blunt end ligation is not efficiently catalyzed by T7 DNA Ligase. Addition of high concentrations of PEG 6000 [≥ 20% (w/v)] to the reaction can force T7 DNA Ligase to have measurable activity. However, under typical reaction conditions blunt-end DNA ligation does not occur in the presence of T7 DNA Ligase, making it a good choice for applications in which blunt and cohesive ends of DNA are present but only the cohesive ends are to be joined. 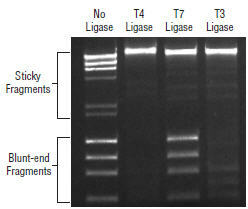 T7 DNA Ligase does not ligate blunt-end DNA fragments. Ligation reactions containing blunt fragments (ΦX174 DNA-HaeIII Digest (NEB #N3026 ) and sticky-end fragments (λ DNA-HindIII Digest (NEB #N3012 ) were set up with 200 ng of each substrate and 1 μl of each ligase, and incubated for 30 minutes at 25°C in their corresponding reaction buffers. Reactions were immediately stopped with 6X loading dye and resolved by electrophoresis on a 1% agarose gel and stained with ethidium bromide. An E. coli strain containing a recombinant gene encoding T7 DNA Ligase. One unit is defined as the amount of enzyme required to give 50% ligation of 100 ng HindIII fragments of λ DNA in a total reaction volume of 20 μl in 30 minutes at 25°C in 1X T7 DNA Ligase Reaction Buffer. Dilution of enzyme for long-term storage at -20°C should be performed with the storage buffer containing 50% glycerol. Diluent A (NEB #B8001) can also be used for those applications in which BSA, present in Diluent A, will not interfere. T7 DNA Ligase is also active in buffers without PEG 6000, such as our T4 DNA Ligase Buffer and NEBuffer 1–4, for applications in which PEG 6000 is detrimental. Please remember to supplement the reaction with 1 mM ATP (final concentration). Using these buffers, the activity of T7 DNA Ligase is reduced approximately 10-fold. Heating a reaction containing T7 DNA Ligase at 65°C for 10 minutes will inactivate the enzyme. However, the reaction needs to be performed in a buffer without PEG. Do not heat inactivate if there is PEG in the reaction buffer, as transformation will be inhibited. Doherty, A.J. et al. (1996). J. Biol. Chem. 271, 11083-11089. Subramanya, H.S. et al. (1996). Cell. 85, 607-615. T7 DNA Ligase is described as an enzyme that only ligates DNA fragments with cohesive ends. What length of cohesive end can T7 DNA Ligase ligate? Can T7 DNA Ligase be used with a buffer that does not contain PEG? Can T7 DNA Ligase be heat inactivated? What are some potential problems with the ligation reaction using T7 DNA Ligase that can lead to transformation failure? What problems can be encountered in the restriction digest that can cause ligation using T7 DNA Ligase or subsequent transformation to fail? How much DNA should be used in a ligation using T7 DNA Ligase? Will T7 DNA Ligase work in CutSmart buffer?